Karpathos This oblong island, third largest in the Dodecanese, possesses incomparable natural beauties and traditions jealously guarded by its inhabitants. 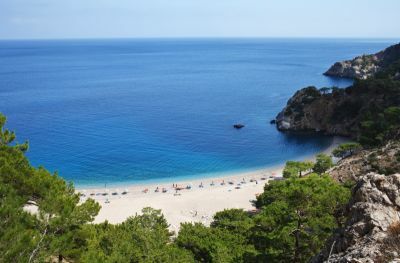 The area of Northern Karpathos, which includes the islet of Saria, is comprised of the districts of the Community of Olympus with 104.8 square kms, the former Communities of Mesochorio with 34.8 square kms and Spoa with 17.0 square kms. A generally mountainous island with deep bays often full of greenery picturesque valleys and dented coasts. Agia Marina, capital of the island, is overlooked by the Franco-Byzantine castle. Lakki, only 3 km from Platanos, is one of the biggest natural ports in the Mediterranean, which can accommodate large ships and yachts. It has a yacht refueling station. We'll get round the island by hiring a taxi or a small caique. Places we can visit include Xirokambos, Koukouli, Kithoni, Panagies, Blefouti, Gourna, Lepida, Temenia. The ruins of a Byzantine castle remain on mount Kasteli. Every year, on the last Sunday in Lent, there is a Carnival in Leros - complete with chariot parade, fancy ball and wine festival. Other memorable events on the island include Alinia, a cultural, sports and arts event taking place on the beach of the same name in the first half of August; also the Agia Kioura feast taking place in Partheni on the 19th of October, and the feast of Madonna of the Castle on the 14th of August.